National Parks manage most of the public open space at La Perouse (all except Frenchman’s Bay, Timbery and Cann Parks). National Parks are responsible for Congwong and Little Congwong beaches, Cape Banks, the Military Heritage at Henry Head and Cape Banks, The Minmi Wreck, the Depression Camp heritage in Happy Valley, the Historic Coast Cemetery, Brown’s Rock Fishing Platform, the Laperouse Museum within the Cable Station, the Receveur tomb, Laperouse Monument*, Macquarie Watchtower, Bare Island and Astrolabe and Cruwee Coves. They are responsible for keeping down weeds such as bitou, protecting native fauna and flora (including Eastern Suburbs Banksia Scrub) and eradicating feral animals which prey on native animals or destroy native vegetation. National Parks are responsible for toilets overlooking Congwong Bay and the toilets at Cape Banks(not open to the public). NOTE: The Cable Station, Monuments (Laperouse, Receveur, Watchtower) and land within the La Perouse Loop are leased to Randwick City Council until 2058. 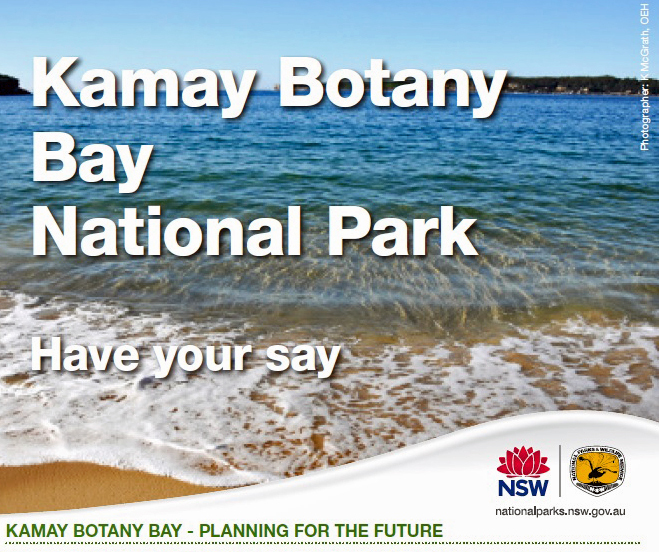 However, this area remains part of the National Park and is subject to the Kamay Botany Bay Plan of Management. Tuesday 5th September 2017 saw a new chapter unfold in the life of the Lapérouse Museum. 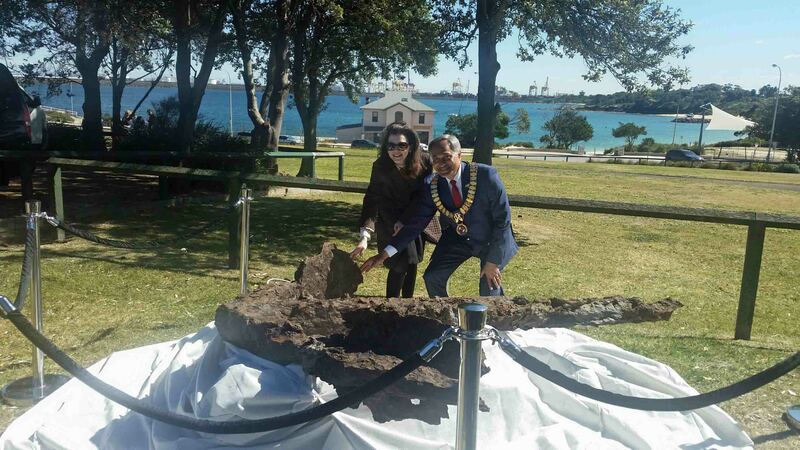 Situated on the northern headland of Botany Bay, the Museum was established in 1988 to coincide with Australia’s bi-century and the landing of French Naval Officer Jean-Francois de Galaup, comte de Lapérouse in 1788. 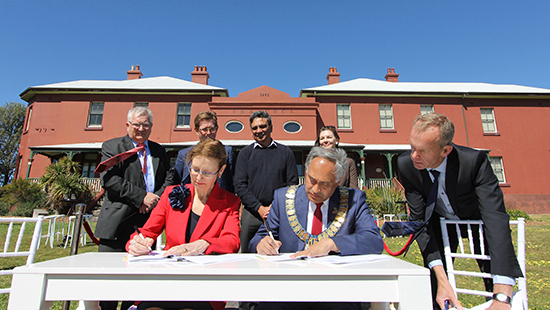 The NSW Minister for Environment and Heritage, Gabrielle Upton and Randwick City Mayor, Councillor Noel d’Souza signed an historic agreement that will transfer management of the Lapérouse Museum, on a long-term lease (2 x 21 years) to Randwick City Council. The transfer, which is several years in the making, will result in the Museum’s maintenance and running assured by Randwick City Council. 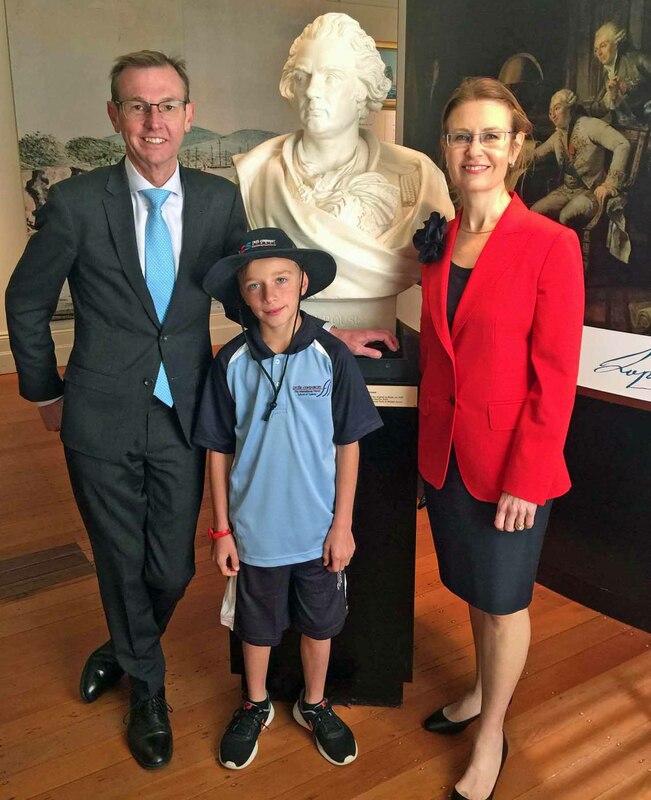 Much needed funds allocated in Council’s budget can now be released and directed towards repairs and restoration of the Lapérouse Museum, Lapérouse Monument, Père Receveur Grave and Macquarie Watchtower. A stakeholder’s advisory Trust will advise Council and a consultation process underway will decide the best uses for these significant assets that attract many visitors to the area from Australia and abroad each year. Randwick Council aims to elevate this important location to one of the nation’s principal cultural destinations. This unique site is very important to France. It marks the beginning of the France-Australia relationship a 229 year long affair that continues to grow, strengthen and prosper. The establishment of the Lapérouse Museum in 1988, was the culmination of a joint four year Australia-France project for our nation’s bicentenary. Throughout the Museum’s life both the Royal Australian and French Navies regularly gather here to commemorate Lapérouse’s unprecedented visit and to pay homage to all Mariners past and present, who often serve far away from their homeland. 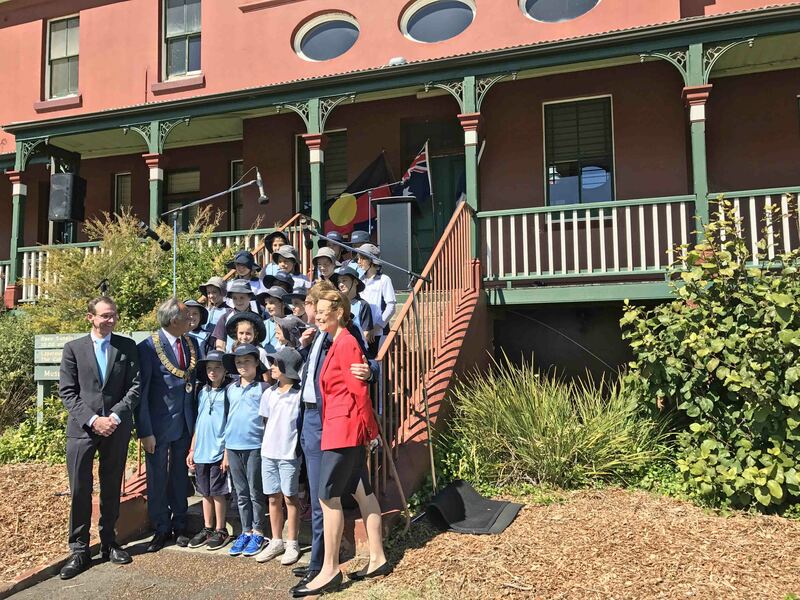 A ceremony conducted with dignity and respect accompanied the official signing of the new lease, presided over by Peter Hay, Executive Officer for the Greater Sydney Region of the NSW National Parks and Wildlife Service. Honoured guests and participants included Michael Wright CEO of the NSW Office of Environment and Heritage, NSW Member for Coogee and former Randwick Council Mayor the Hon. Bruce Notley-Smith, the Consul General for France Nicolas Croizer, Gary Ella representing the La Perouse Indigenous community, Randwick City Councillor Sima Truuvert, Director of City Planning, the Lapérouse Museum’s curator Elizabeth Broomhead, Nicole Forrest Green (President) and Tony Gentile (Secretary) representing the Friends of the Lapérouse Museum and the Principal of the French School, Maroubra the Lycée Condorcet, Philippe Courjault accompanied by Year 5 primary students who performed both the Australian and French National Anthems. 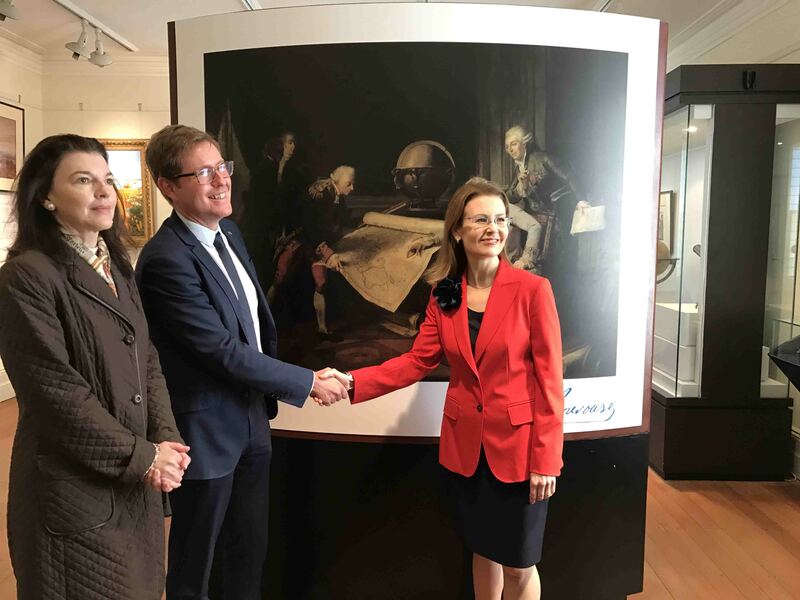 Minister Upton is to be commended for her efforts in taking charge of this project and assuring the transfer of the Museum’s management and other related sites, took place in a timely manner. This long awaited result will breathe new life into the area and will allow for greater access to facilities, and increased Museum operating hours. The management agreement will officially come into effect on Thursday October 26 2017. 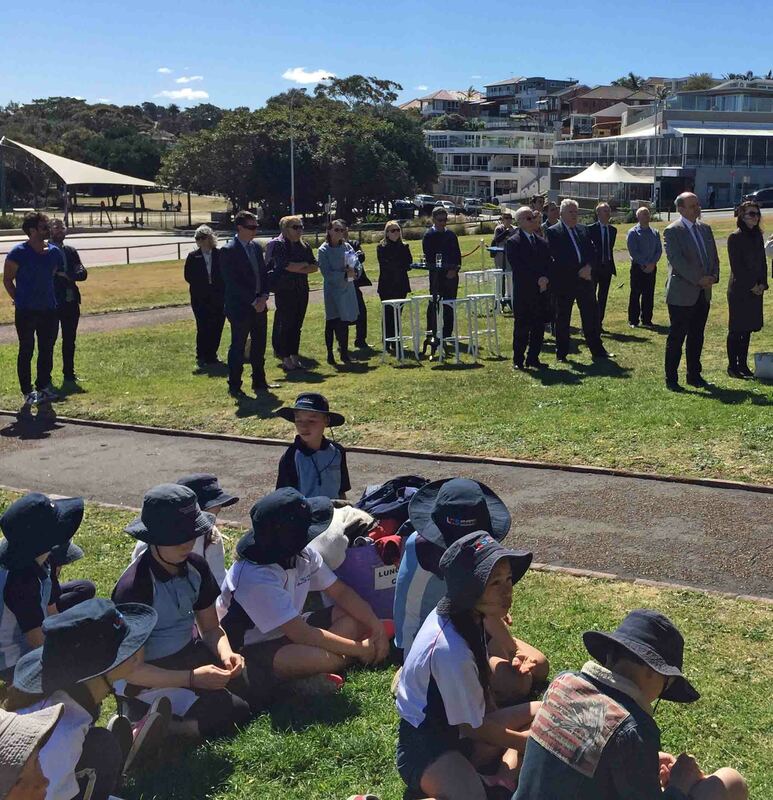 (Pictured above: Schoolchildren from the French School at Maroubra including a descendent of the family of Pierre le Gobien with Minister Upton and Bruce Notley-Smith MP Coogee who as Mayor of Randwick first raised the possibility of the lease. Pierre le Gobien joined the expedition in the Philippines in May 1787, celebrated his 21st birthday in June aboard L’Astrolabe and was promoted to 2nd Lieutenant at Botany Bay, March 5th 1788). The Friends of the Lapérouse Museum thank all parties who worked tirelessly across many years to ensure the result achieved today and look forward to the future with great anticipation. We received mixed reports about the usefulness of CMPs. While heritage assessment and planning is critical, and indeed a requirement for state significant heritage, there are concerns that CMPs do not always balance aspiration with the management reality of constrained resources, nor do they always provide sufficient guidance on the potential compatible uses for an asset. While State of the Parks data is a source of qualitative information about park management and trends over time, it does not provide a robust assessment of the efficiency of the agency’s approach to historic heritage management. Despite the Office of Environment and Heritage’s asset strategy identifying historic heritage asset maintenance in the reserve system as a key management issue, it contains no specific asset or service performance measures for NPWS historic heritage. • by December 2014, measure its performance in managing historic heritage, including the extent to which it is achieving its desired outcomes.